Which Method of Transportation Do You Need? New York to Ohio shipping and trucking services are in high demand; Albany to Sandusky is a very heavily traveled route for freight transportation. The Albany, NY to Sandusky, OH shipping lane is a 538 mile haul that takes more than 8 hours of driving to complete. Shipping from New York to Ohio ranges from a minimum of 459 miles and a 7 hours from New York City, NY to Cleveland, OH, to over 720 miles and a minimum of 11 hours on the road from Saratoga Springs, NY to Florence, OH. The shortest route from New York to Ohio is along I-90 W; however, there is a more southerly route that also uses the I-80 W traveling through Scranton, PA. The ‘Empire State’ has an exceptional economic location for New York trucking companies, as it neighbors six states and a number of America’s most prosperous cities. It also shares a border with Canada’s economic centers: Toronto and Montreal. New York’s close proximity to major US cities has created a boom in the freight trucking industry, especially with routes to Cleveland, Detroit, Pittsburgh, Philadelphia, Chicago, Cincinnati and Indianapolis, with their strong automotive, heavy manufacturing, publishing, printing, biomedical, biotechnology and telecommunications industries. Within the state itself, the major routes for New York freight companies are between New York City, Buffalo and Rochester. New York’s geography and climate creates unique challenges in terms of shipping. It has varied terrain with mountains, forests, valleys and lakes—and a number of microclimates. The great variance in weather, between humid summers and bitterly cold winters, poses further challenges, as do New York’s strict commercial shipping regulations. Almost Home of the Mighty Buckeyes, Ohio links the northeast to the midwest and contains some of the busiest trucking routes in the country. Ohio is within a one-day drive of 50 percent of US residents and 70 percent of North America’s manufacturing capacity. Bordered to the north by Lake Erie, an important cargo port area and to the south by the Ohio River, Ohio’s nearest neighbors are Pennsylvania, Michigan, Ontario, Indiana, Kentucky and West Virginia. 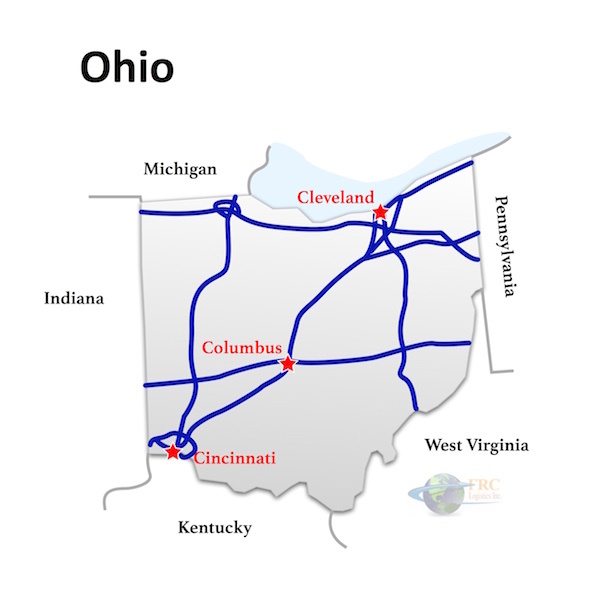 New York to Ohio Freight shipping quotes and trucking rates vary at times due to the individual states industry needs. Since New York and Ohio are mainly an industrial state, we see plenty of shipments by refrigerated trailer, flatbed as well as by the more common dry van trucks. Heavy Haul Trucking services are also common from New York to Ohio. Our Less Than Truckload (LTL) carriers are also running a number of regular services between the two states, and it’s an active route for heavy haul freight shipments, as well. Its the Better Business Bureau Seal. Copyright © 2019 FRC Logistics Inc. All Rights Reserved.